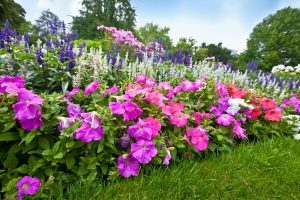 If you are thinking about starting a flower garden, it can be difficult to figure out how to get yourself started. That’s because gardening is a nuanced, complex process that takes place over a long period of time, so finding flower gardening tips that are written to your level of experience can be challenging. Luckily, for beginner gardeners, the most important initial techniques have to do with thinking ahead and having a thorough process. Remember, there are times of year that work best for each stage of your garden’s planning and cultivation, so you need to be prepared for them. When the weather shifts, there might be a limited number of days that meet the criteria you have for certain steps, like planting or transplanting. That’s why it is good to work out your garden plan on paper, and to look ahead to the best time to take each step. Spring is when growing, digging, and transplanting works best, because the plants have a long growing season to take root. Summer is the most time-consuming part of gardening, and it requires you to regularly tend to your plants. Fall is when you can plant bulbs and trees, shrubs, and even some of your perennials. It’s also important to have locations and arrangements of flower choices picked out so that you can move quickly when the weather is right for your next step forward. Clear and prepare the ground before you start. If necessary, do it on a different day. Improve the soil. Using fertilizers and other soil enriching supplements will make it a more hospitable environment for your flowers. Choose your plant food to suit your flower selections. Dig when the soil forms a loose ball in your fist, not when it is too dry and loose or when it is too muddy. Following these basic flower gardening tips for beginners will help you get started successfully. From there, it’s a matter of learning the process and developing your garden plan. Are Tulips Poisonous to Chickens? Copyright © 2019 How to Grow, Plant & Care for Tulips – GrowingTulips.com. All Rights Reserved.